ADAM BUCKO is cofounder of the Reciprocity Foundation, empowering homeless youth to break the cycle of poverty, and HAB, an interspiritual contemplative fellowship focused on training young people in radical spirituality and sacred activism. MATTHEW FOX is an internationally acclaimed theologian working in the creation spirituality tradition of Christianity. He is the best-selling author of 30 books, including Original Blessing, A Spirituality Named Compassion, and The Coming of the Cosmic Christ. Named one of the Fifty Best Spiritual Books of 2013 by SPIRITUALITY & PRACTICE in the JUSTICE category! This book is a call to action for a new era of spirituality-infused activism. 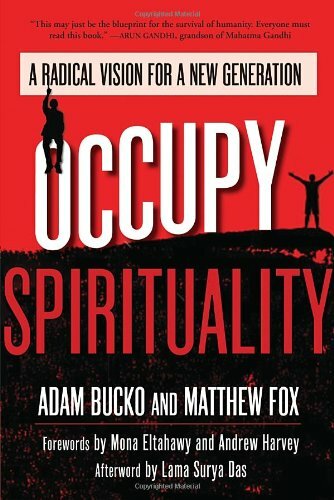 Authors Adam Bucko and Matthew Fox encourage us to use our talents in service of compassion and justice and to move beyond our broken systems–economic, political, educational, and religious–discovering a spirituality that not only helps us to get along, but also encourages us to reevaluate our traditions, transforming them and in the process building a more sacred and just world. Incorporating the words of young activist leaders culled from interviews and surveys, the book provides a framework that is deliberately interfaith and speaks to our profound yearning for a life with spiritual purpose and for a better world. Each chapter is construed as a dialogue between Fox, a 72-year-old theologian, and Bucko, a 37-year-old spiritual activist and mentor to homeless youth. As we listen in on these familiar yet profound conversations, we learn about Fox and Bucko’s own spiritual journeys and discover a radical spirituality that is inclusive, democratic, and relevant to the world we live in today.